This page is only shown if you chose Exchange Integration on the previous step. 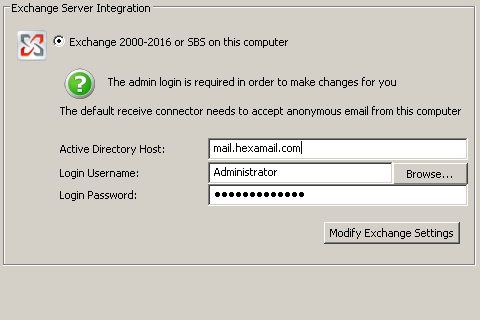 The page allows you to configure your administrator username and password, which allows Hexamail Guard to automatically adjust settings within Exchange to run optimally with Hexamail Guard. If the service is running as a System service (default) you need to specify a login password for the username that has access to Active Directory. This login is typically the one you use to logon to the Active Directory computer as adminsitrator. This password is sent and stored using strong encryption by the service.